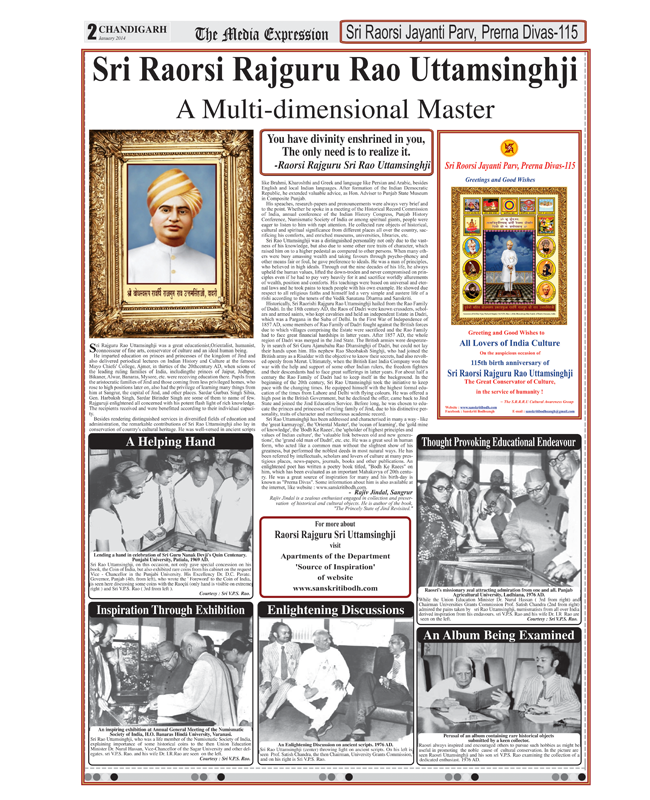 Research – piece by Rajeev Jindal, Secretary of Sangrur Heritage Preservation Society : Sri Rajguru Rao Uttam Singhji was a great educationist, Orientalist, humanist, connoisseur of fine arts, conservator of culture and an ideal human being …. He not only imparted education on Princes and Princesses, but also those coming from less privileged homes, who served the country on high positions…. still, more remarkable contributions of Sri Rao lay in conservation of country’s cultural heritage …. was distinguished not only due to the vastness of his knowledge, but also due to some other traits of character, which raised him on to higher pedestal as compared to other persons. … hailed from the historical Rao Family of Dadri …. the Raos of Dadri have been known crusaders, scholars and armed saints, who kept cavalries and held an independent Estate in Dadri, which was a Pargana of the Suba of Delhi…. The Rao Family had to face great financial hardships due to participation in the First War of Independence in 1857 AD…. Sri Rao Uttamsinghji has been addressed and characterized in many a way ― like the ‘Great Karmayogi’, the ‘Oriental Master’, the ‘upholder of highest principals and values of Indian culture’, the ‘valuable link between old and new generations’, the ‘grand old man of Dadri’, etc.etc …. a poetry book on him, titled, “Bodh Ke Raees,” has been evaluated as an important Mahakavya i.e. epic of 20th century ,,,, his birthday, the Raorisi Jayanti Parv, is known as “Prerna Divas” … The Media Expression : Prerna Divas – 115 Special Issue : January, 2014.